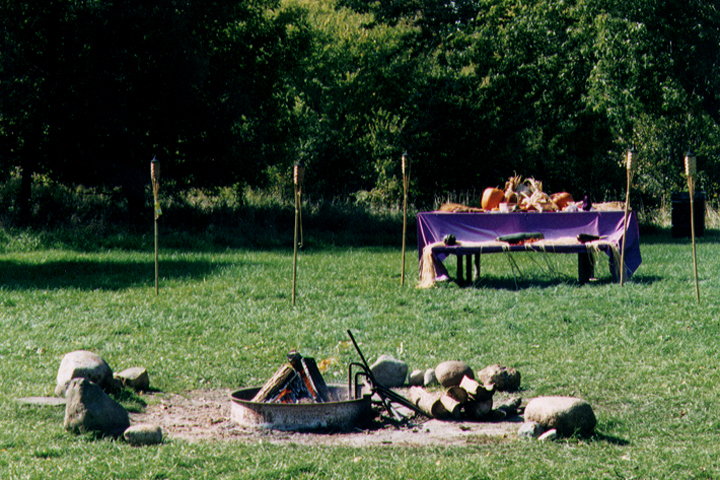 Pagan traditions have a strong focus on ritual, and practitioners may draw from multiple sources or follow a single contemporary Pagan tradition. The largest of the latter is Wicca, a form of religious witchcraft that includes dozens of lineages, paths, and styles. Other traditions include Druidry, non-Wiccan forms of religious witchcraft, Heathenry and Ásatrú (Northern European Paganisms), feminist Goddess worship, and a variety of reconstructionisms—including Greek, Egyptian, Celtic, Roman, Canaanite—as well as other historical religions. Some practitioners of Afro-Caribbean religions also may consider themselves to be Pagan, while others do not. Pagan rituals commonly focus on honoring a deity or deities; observing natural cycles, such as seasonal changes or the waxing and waning of the moon; or celebrating rites of passage, such as birth, transitioning into adulthood, marriage, and death. Although the form of ritual varies by tradition, Pagan rituals tend to engage the participants physically. Rituals often include drumming, chanting, and dancing. Some Pagans offer food or drink to their gods or ancestors; these offerings may be shared by the participants as part of a feast, or sometimes disposed of ritually. Representations of earth, air, fire, and water may also be employed for cleansing and consecration: for instance, participants might anoint themselves with salt water (earth and water) and burn incense (air and fire) as part of ritual preparation. 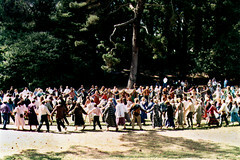 Pagans generally do not proselytize and, while classes and retreats may introduce people to the path, the initiative to practice is with each individual. Some Pagans also participate in other religious communities such as churches or synagogues. 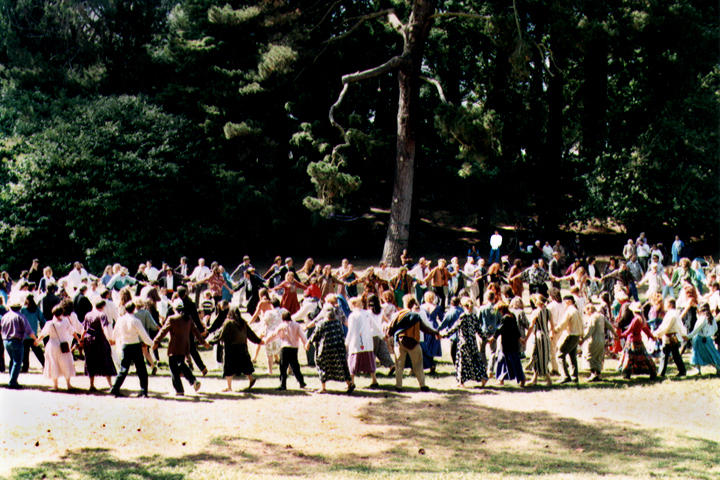 From the 1970s through the early 1990s, the source of growth in Paganism was through small groups—variously called groves, nests, covens, or circles. After the mid-1990s, the availability of Internet and communications technology increased access to religious material for geographically isolated Pagans, who slowly grew into a majority in the movement. 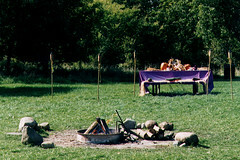 Although some Pagans still practice regularly in either small private or large public groups, many are “solitaries,” meaning they practice alone and may only gather with a group for special occasions. Sociologist Helen Berger reports that as many as 79 percent of American Pagans today may identify as solitary. Most do not celebrate within a specific temple or building, though there are a few Pagan temple buildings in the United States. On the whole, Pagans prefer to worship out of doors, or else in private homes and rented halls. Building an altar—a place for divinity, and a sacred workplace for performing rituals—is one of the first ways many Pagans begin spiritual practice. Pagans often have altars in their homes, sometimes tucked in a corner of the bedroom. Pagans with yards, or those who live in rural settings, may build altars outdoors. The altar may contain natural objects, photographs of the beloved dead, ritual tools, and objects of beauty or personal power. At the altar, one might leave an offering for a deity, enter into meditation, create an herbal charm, or undertake a personal cleansing or healing ritual. Gazing at an altar is a reminder of one’s spiritual life, and meditating there can lead to spiritual insight. Pagans might perform a wide variety of spiritual exercises on a daily basis, though probably no two Pagans practice their faith exactly the same way. Pagan personal practice can be as simple as lighting a candle at the dark of the moon and meditating on the flame, or pouring a fresh cup of water for one’s ancestors and saying a prayer. Spoken intention is thought to be very powerful: Pagans often believe that verbalizing their desires is the first step toward bringing change into their lives. Respect for this principle leads many Pagans to choose their words carefully, lest a habit of self-deprecation or pessimism interfere with achieving life goals. One important form of daily practice for many Pagans is “grounding” meditation, which connects the individual with the energy of the Earth and helps to maintain physical and emotional balance. Another is the practice of divination, which may take the simple form of asking about the day ahead, or inquiring about a specific question. Some Pagans consult astrology, while others use Tarot cards, runes, or pendulums to access sources of spiritual knowledge. Others look to movements in the natural world—interactions with animals, plants, wind, and water—to gain intuitions about patterns in the local environment. The sense of connection gained through these practices helps Pagans live out their belief that divinity is present in the world around them. Some Pagans choose to wear sacred jewelry. Pagan symbols include the pentacle, an interlaced five-pointed star that is often worn by Wiccans. The star is pointed up to align with an upright human body, with one point up for the head and outward- and downward-facing points for the arms and legs. The pentacle is a symbol of life and the union of the elements (earth, air, water, and fire) with spirit, though it has often been misrepresented as a symbol of evil in popular horror films. Not all Pagans use the pentacle as a religious symbol, however. Pagans who follow a Northern European path may wear Mjölnir, Thor’s hammer, a traditional religious pendant worn by those resisting Christian conversion in medieval Scandinavia. Images of natural objects, such as trees, or abstract Goddess figures are also popular among Pagans. In 2007, the Department of Veterans Affairs added the pentacle as an approved religious symbol for veterans’ headstones, a decision that delighted Wiccans. Druids and Heathens are in the process of petitioning to have their symbols of choice approved. Many Pagans practice magick (often spelled with a ‘k’ to differentiate it from stage magic and the fanciful magic of fantasy novels). In Paganism, magick is a spiritual practice aimed at creating change in the individual and in the world. Magick functions somewhat like prayer in other traditions, but it tends to have more of a physical component than prayer usually does in the West. When Pagans do magick, they begin by stating a clear intention and then raise energy to support that intention. This might be done, for instance, through chanting and dancing, breath exercises, or concentration. The energy is then released, either out into the world or sometimes into an object that will serve as a focus for the intention. The latter could be a candle, a piece of jewelry, or an altar object. Pagans often feel that magick cannot be successful without a practical component. Successful job magick, for instance, involves filling out job applications, not just setting intention and raising energy.